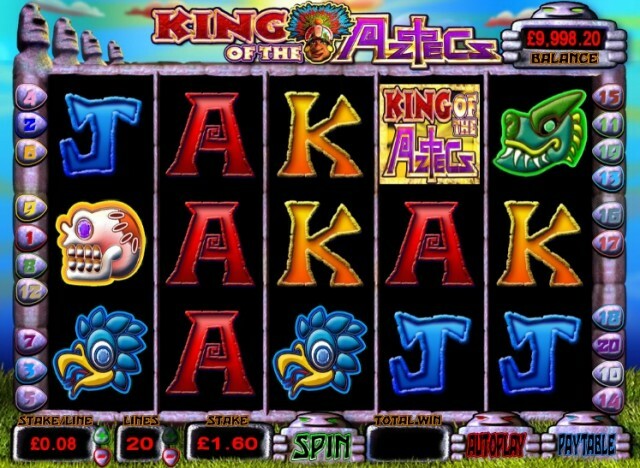 Barcrest are surely making a statement with their latest release, the 20-pay line King of the Aztecs. This one time top fruit machine developer is now providing the video slot gamers with good quality games and this latest edition includes some of the style and panache that is common throughout their projects. This slot encompasses a great Aztec theme and Barcrest have left no stone unturned in making sure it is a truly authentic slot to play. Players are greeted to a neatly designed backdrop, finished with some very high quality graphics. In amongst this players are treated with a variety of amusing animations, one of which involves the tribe leader stepping from the slot to celebrate a substantial win and showering players’ screens in a river of coins. The development of the design is a great credit to the team at Barcrest and still has that true original fruit machine feel regardless of its size. In terms of the game play the reels fall faster than you can say “A-Z-T-E-C” giving it a really quick pace, providing a rather intense and fun game. The effort has clearly gone into making the gameplay as enjoyable as possible even within the standard game, which is often overlooked for lavish bonus rounds and extravagant features. The expected symbols are used within the standard game and the slot pays when three or more are hit on an active pay line. Players should look out for the lucrative wild symbols which expand the entire reel – only available on the middle 3 reels the “expanding” wilds allow surrounding symbols to be incorporated into a series of multiple winning lines. Barcrest have decided not to include a bonus round in King of the Aztecs which is surprising as with this addition the slot has the potential to be a lot more popular. Regardless, for a quick spin the game delivers in leaps and bounds, providing a quality game with a very respectable pay out rate. For players who are disappointed about the choice to discards a bonus round will be jumping for joy when they are given the chance to double their winnings in a great double up game. For a chance to get your hands on some of that luscious Aztec gold make you way over to Sky Vegas today.